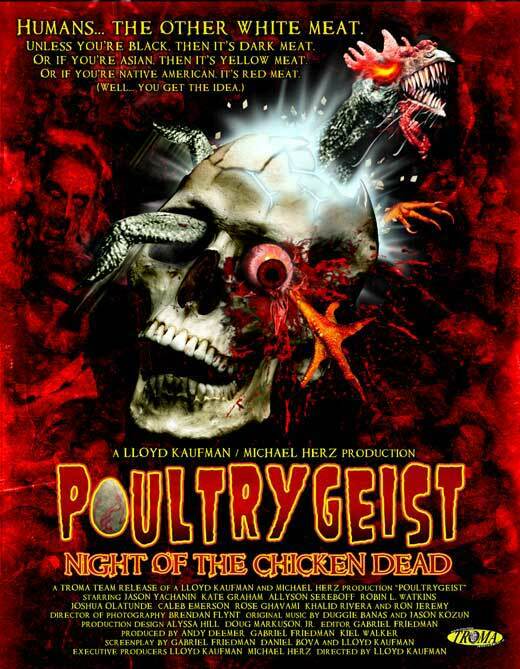 “Poultrygeist: Night of the Chicken Dead”. The title alone gives you a clue that you will be in for wit and laughter throughout the entire movie. For fans of Lloyd Kaufman and Troma Entertainment movies, this over-the-top gore fest should be on your must-see horror movie list. With a completely comical and insane plot that stars your typical heartbroken underdog Arbie (Jason Yachanin) who takes “revenge” on his ex-girlfriend-turned lesbian Wendy (Kate Graham) by applying for a job at the fast food chain she’s protesting against. Add in some musical numbers and this movie is completely golden. American Chicken Bunker, the fictional fast food chain that’s built on top of the Tromahawk Indian Burial Ground is the grease filled, mutated fried chicken serving establishment where the whole movie is set. As soon as the restaurant opens its doors for customers, it is clear that the spirits in the burial ground are not pleased, and the rag-tag crew at American Chicken Burger are met with accidents at every turn. These “accidents” are far from their biggest threat, because the chicken dead are determined to cause the most grotesque of horrors as they devour everyone they come across. A horror movie with undead chickens, mutated burgers, and musical numbers is bound to keep you entertained for the whole 103 minutes. Curious if this truly outrageous film will please your palette? Take advantage of free online movie streaming and watch it now. If Poultrygiest isn’t refined enough for to satisfy your horror movie craving, there are more chances to watch movies online free!